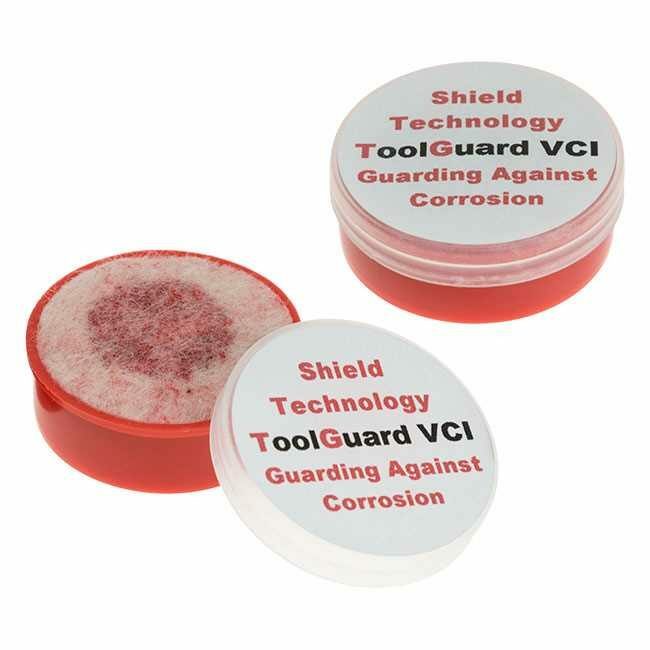 ToolGuard VCI is a powerful vapour phase inhibitor for protecting tools and tooling stored in drawers and toolboxes and manufacturers packaging. The VCI chemical is absorbed into a felt pad inside a 35mm diameter lidded plastic pot. On removal of the lid, the VCI chemical permeates the enclosed volume forming a monomolecular protective layer on every surface; be it steel, iron, wood, plastic etc. Because it is a vapour, it will find its way into every nook and cranny. ToolGuard VCI works at up to 100% RH and is effective for 12 months in a volume of 2 cubic feet. They are ideal for protecting precision measuring equipment, collets, hand tools and machine accessories. Because it does not lower the level of humidity, like a desiccant, it will not distort any delicate pieces of a model made from wood - which ‘moves’ with changes in humidity. ToolGuard VCI has found many applications other than those just listed. Museums use them to protect artefacts in display cabinets, the shooting fraternity have used them with great success in gun cabinets, and woodworkers use them for protecting valuable hand tools.